The latest HKS EVC Boost Controller (45003-AK005) has new advanced features such as boost pressure correction mapping so boost levels can be fine tuned for various engine and vehicle dynamics. The EVC Easy Writer software allows tuners the ability to setup and monitor these new advance features of the EVC via a laptop computer. Boost Pressure Correction Mapping: Viewed in 3-Dimensional Graphs and 5×5 Maps, boost pressure can be fine tuned for: RPM, Vehicle Speed, Throttle Position, RPM Throttle Position, or Speed Throttle Position. Map Function ON/OFF (whether to use a boost pressure correction map), choice of which correction map to use. 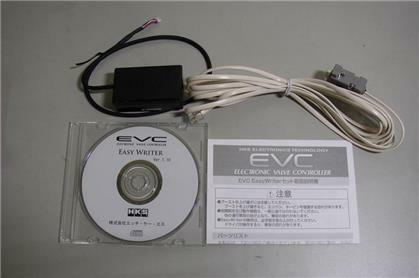 Easy Writer software coverts laptop PC into data logger for engine/vehicle signals being monitored by the EVC boost controller (Boost Pressure, RPM or Vehicle Speed, and Throttle Position). Settings can be saved to user’s laptop computer. If changes are made thereafter, the saved settings can be recalled and restored.